However, both AirPlay and AirPlay mirroring have limitations for users to fully enjoy movies, photos, and music wirelessly. With AirPlay, you still cannot stream iTunes unfriendly video format like ISO, TIVO, RMVB, VOB files to HDTV with Apple TV. 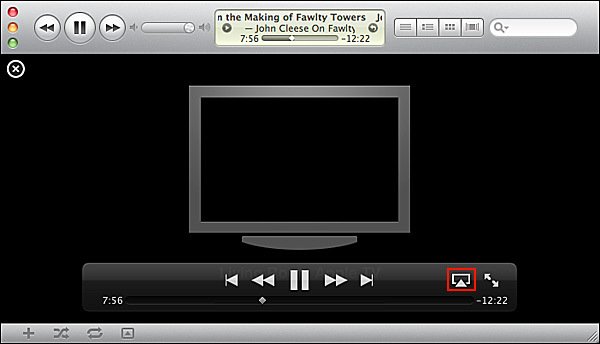 And AirPlay mirroring in only limited to Mac OS X Mountain Lion users whose computer is iMac (Mid 2011 or newer), Mac mini (Mid 2011 or newer), MacBook Air (Mid 2011 or newer), and MacBook Pro (Early 2011 or newer).The older Macs mentioned or the Windows PC users cannot take advantages of the AirPlay mirror. In order to AirPlay ISO, TIVO, RMVB, VOB files from Windows PC or Mac computer with Apple TV to HDTV, we will need to convert the files to iTunes compatible MP4 or HD MP4 in 1080p/720p. This article introduces on how to convert ISO, TIVO, RMVB, VOB files to MP4 or HD MP4 and on how to AirPlay the converted files to Apple TV 2 or Apple TV 3. Wondershare Video Converter Ultimate is a all-in-one video converter, DVD Converter and DVD burner, which lets you convert videos/DVDs to and from virtually any video format out there including DVD, ISO, IFO, VOB, TIVO, RMVB, MKV, TP, TS, AVCHD MTS, M2TS, MOD, TOD, MOV, MP4, FLV, F4V, OGM, OGV, OGG, WebM, YouTube, M4P, M4V, etc. The Video Converter Ultimate not only provides video conversion 30X faster but also provides better experience for edit and enhance to personalize your Media files and one-click video downloader to download videos from online video sites. Directly drag and drop your video files to the interface of Video Converter Ultimate; or you can press on “Add files” button to browse and add files. If you aim to airplay ISO, TIVO, RMVB, VOB from computer to Apple TV 3/Apple TV 2, click on “Output Format” drop-down. 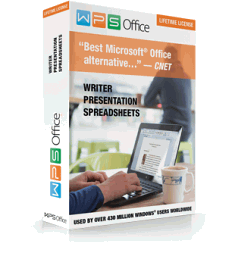 Move to “Format” tab and choose “MP4 Video” as the output format. If you aim to airplay ISO, TIVO, RMVB, VOB from iPad 3/iPad 2/iPhone 5/iPhone 4S/iPhone 4/iPhone 3GS/iPod touch 5/iPod touch 4/iPod touch 3/iPod touch 2 to Apple TV 3/Apple TV 2, click on “Output Format” drop-down. Move to “Format” tab and choose specific device from “Device” tab as the output format. 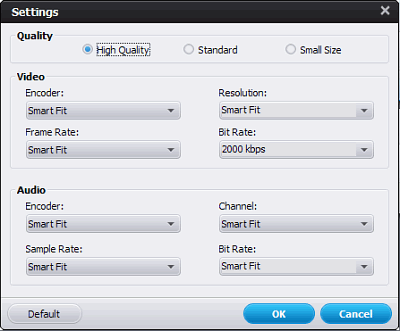 Click on “Settings” to open the “Setting” Window where you can custom output video quality, resolution, bitrate, framerate, audio channels, bitrate, sample rate. 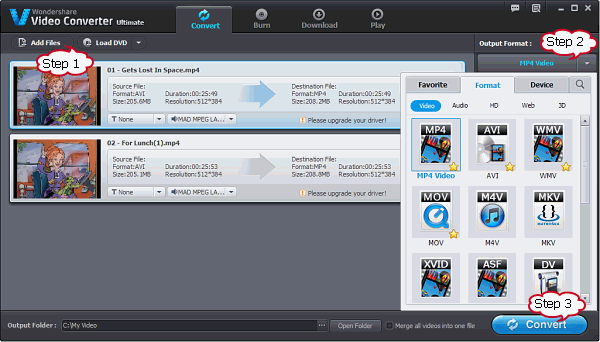 When the conversion is complete with Video Converter Ultimate, click “Open Folder” to locate the converted video files. Hit on “Play Movie” button in iTunes. The movie will start playing. You’ll notice an AirPlay icon in the bottom right corner of the iTunes application show up. Click it, select “Apple TV” and your video will begin streaming from windows PC or Mac computer to your HDTV through Apple TV 3/Apple TV2. To Airplay ISO, TIVO, RMVB, VOB files, etc from iPad 3, iPad 2, iPhone 5, iPhone 4S, iPhone 4, iPhone 3GS, iPod touch 2, iPod touch 3, iPod touch 4, iPod touch 5 to Apple TV 3 or Apple TV 2, when the conversion is complete with Video Converter Ultimate, click “Open Folder” to locate the converted video and drag to iTunes and transfer to iPad/iPhone/iPod touch. Tap the AirPlay icon in a video app. Then videos will be streamed to your HDTV via your Apple TV 3 or Apple TV 2. How to AirPlay Blu Ray movies to Apple TV 2 or Apple TV 3?